Standing in the grocery line I usually look at the scandal rags, searching for Plastic Surgery articles. They usually focus on some surgical disaster such as overblown lips, saggy skin after lipo, excessive skin stretching, etc. Anyways, this week, one of these magazines featured the Housewives of Orange Country and their Botox addictions. Tamra, the 44 year old O.C. Housewife who has a 23 year old son and 3 other small children has been doing botox injections consistently for 3 years. So have many actors and actresses. Perhaps the most notorious Botox addict must be Nicole Kidman, whose forehead is as smooth and glassy as a porcelain doll. She has been criticized for wooden acting, but don’t blame her– It’s the Botox! As a matter of fact, a patient of mine who is a character actor told me that the problem of the inexpressive over-botoxed face is worse in Television, where close-ups are more common. Apparently, a face with expression is hard to find these days. My sources tell me that it got to be so bad that casting directors were casting in England looking for actors who could actually show emotions in their face. You see, in England they are not addicted to Botox. In my own Plastic Surgery practice, Botox is a quick and easy fix. Injected properly, Botox does smooth out wrinkles to create a more youthful appearance. However, after you start using Botox a lot, it loses its advantages. The first is that your face becomes inexpressive. The second is the cost. If you have been doing Botox for 3 years, you could have paid for a minimally invasive procedure that gets rid of the forehead wrinkles, frown lines, and crow’s feet , but does not weaken our muscles of facial expression. With this minimally invasive procedure, people can actually tell whether you are happy, sad, angry, or just chilling out. So what is the cure for those that are botox addicted? 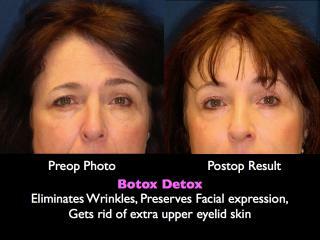 Is there a Botox Detox, where you never have to do Botox again? Yes! The Botox Detox procedure is the endoscopic browlift. The browlift not only permanently smooths the forehead wrinkles, but you get the added advantage that your upper eyelids become lifted to yield a longlasting, youthful, and refreshed appearance. The modern day browlift or forehead lift is a two hour procedure done through small incisions behind the hairline. An endoscope is used to lift the brow to a more youthful position. The procedure can be done under IV or twilight anesthesia in an outpatient surgical facility. Recovery is very quick- within one week you should be back at work. During the post operative week, you will have minor bruising which can be covered with makeup. Up until the mid 1990’s, the traditional browlift procedure involved long incisions across your hairline in order to lift the brow. The use of the endoscope in the browlift procedure changed all of that. The modern day endoscopic browlift avoids the pitfalls of traditional browlift, (your mother’s browlift) because it works by dividing the muscles that bring down the brow from those that elevate it, not by stretching the skin or elevating the hairline. Furthermore, the browlift allows you to maintain natural expressions. With the endoscopic browlift (forehead lift) there are no long scars, no hair loss, no abnormal sensations in the scalp. The result is a very natural repositioning of the brow to a level set by the brow elevator muscles. You get a refreshed, youthful appearance with a slight lifting of the upper eyelids. In contrast to those physicians whose patients have a pattern of returning office visits, I think more like a surgeon. I like to do a procedure that delivers a long lasting result to the patient. If Tamra had had an endoscopic browlift 3 years ago, she wouldn’t need to keep paying for Botox. Her brow would show some life-like expression instead of a smooth mask where only the mouth moves. But perhaps that is the Hollywood way, where looking “done” and spending money is a career move. For Botox Detox, the smart money goes for the Browlift. The wrinkles are gone, but not the expressions that let others know how your heart feels. I have seen several hairline brow lifts and I don’t like them for a couple of reasons. The first one is that there is a scar that although well hidden, is there. The second is that there can be nerve injuries because superficial skin sensation nerves run perpendicular to the scar line and there is no way to avoid them. This can sometimes give abnormal sensations or even very uncomfortable feelings of ants crawling in your skin. The endoscopic forehead lift does not work by pulling back on skin but by separating the elevator muscles of the forehead from the depressor muscles around the yes. This procedure is based on the natural pull of the frontalis (forehead) muscle rather than pulling back of skin.